Roses grow on you! . . . . .
Its week number two for recipes that centre around wildfoods. This week its a dish that combines quail and roses . . . yes roses. For centuries, roses have been that special ingredient in creating the finest culinary dishes and something, that for some reason has been forgotten, by-passed or just simply gone out of fashion. Though for me, great food, a great dish can never go out of fashion, how a dish is presented may do, but the a great dish is always a great dish. A rose dessert dating to the ancient Romans is the earliest recorded recipe using roses as an ingredient that I know of. Other ancient civilisations however also used the sweet, fragrant qualities of their own native rose species. In the Tenth century, it is known that Persia was exporting rosewater to most of Europe, North Africa and Asia, which commonly used as a flavouring agent in cakes, biscuits and pastries dishes. By the medieval Fourteenth century, roses were used extensively in fish and game sauces as well as sweet dishes. Many a royal chef prepared such delights as Roseye of Fysshe (fish in a rose sauce) and Rede Rose (a red rose pudding). While in the Nineteenth century, roses were widely used throughout the world as both a colouring and flavouring agent in teas, sauces, oils, preserves and many, many more dishes. Never use roses treated with insecticides or fungicides unless those products are approved for food crops! Thoroughly rinse the roses (particularly the petals) before using. Who wants to find a spider or other garden bug in their foods?! Red roses are by far the best; yellow, orange and mauve-coloured roses tend to turn brown when cooked, while white roses can have diuretic qualities (they help flush the water from the body). Okay, so quail are very expensive I know, or you dont fancy them or cant find quail . . . no problems. This recipe would work equally as well with chicken. You could use a whole chicken or pocket a boneless chicken breast (called a supreme) and stuff them instead. 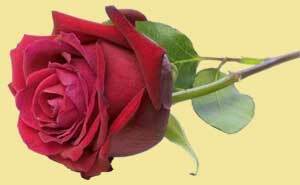 Red Roses cause the water to turn a pale pink, other coloured roses turn the water a brownish yellow muddy colour. The actual ratio of roses to water depends on the colour and fragrance desired.